See all Canyon Crest - For Sale. See all Canyon Crest - Sold. Canyon Crest at The Canyons is a gated luxury neighborhood in the master-planned community of Summerlin comprised of 64 custom homes that were built between 1999 and 2004. Situated on large lots over a quarter of an acre, the luxury homes range in size from 2,300 to 6,100 square feet. Some have pools/spas, RV parking, built in BBQ’s, walk-in closets, covered patios, and casitas. The southern part of the neighborhood has homes that overlook a walking trail called Cottonwood Canyon, which is a 70-acre park filled with beautiful scenery, biking and walking trails, and picnic areas with grassy fields, wildflowers, and mountain views. 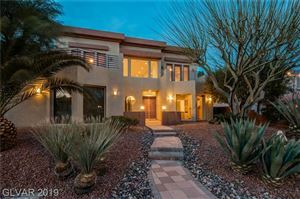 Enjoy close proximity to the public TPC Las Vegas golf course just over a mile away and the private TPC Summerlin golf course about two miles away.